Glow Beauty Magazine offers the latest information on products, treatments, procedures and technologies to achieve vibrant good health, radiant beauty and positive spirits. provides the latest information on products, treatments, procedures and technologies to achieve vibrant good health, radiant beauty, and positive spirits. Written by the country's top medical experts, cosmetic and beauty journalists, each issue addresses topics of interest to today's consumer. is a twice-yearly publication with private distribution throughout Manhattan, Long Island, and the Hamptons. GLOW is distributed to leading salons, spas, hotels, restaurants, as well as top residential buildings, concierge services, and unique upscale venues including private jet companies and the Hampton Jitney. 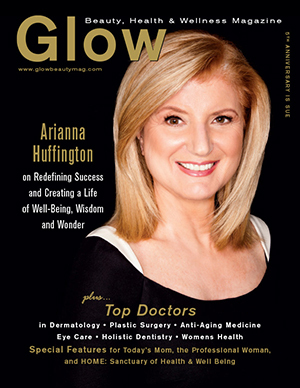 GLOW is available both in print and digital editions. reaches an expanded audience through strategic partnerships with leading professional networking groups, luxury retailers and not for profits dealing with critical issues in women's health and leadership development. Through the GLOW SPEAKERS BUREAU, a roster of speakers are made available for professional, civic and community organizations, as well as charitable events. Anne Akers is a seasoned Publisher, who has published award winning consumer books in aesthetic medicine, medical journals, and educational publications in varied medical specialties. A former Founder/ Publisher of Castle Connolly Graduate Medical; Co-Founder/Publisher of MDPublish.com, and owner of a business development consultancy group for private physicians. Anne has served on various boards for women's health including the Skin Cancer Foundation and the National Host Committee for the National Osteoporosis Foundation. She currently services on the Board of Directors for VOICE/Ovarian Cancer Foundation and Shining Service Worldwide, honoring returning female Veterans.